Can The House Edge Be Overcome? What is a Skill-Based Bonus? Bring consistency to your winning streak while playing slot machines is easier said than done. In fact, it is one of the most difficult things a slots player could possibly hope to achieve. This is because slot machines are inherently fickle, which means sometimes you will win, and sometimes you are going to lose. Winning consistently, while playing slot machines is unfortunately not on the table for those who want to take on the infamous one armed bandit. But, it doesn’t have to be that way always, because the secrets of consistent winning lies in gaining a deeper understanding on how slot machines are programmed. So, how can slot machine players expect to beat a software program that has been designed to pay back just 97.5% of the money that is played? For years casino executives have prided themselves on the one fact of all new slot machines, which is that a machine that has been programmed to pay back 97.5% of the money played will eventually return the same percentage, or come really close to that number. So, how can a slot machine lose money when all slot machines are programmed to pay less than 97.3% of the coins that are played? Unlike other casino games where the player gets to see the cards, the roulette wheel, or the dice, the elements that makes up each placement of the reels on a slot isn’t visible to the player. Here, we are going to enlighten would-be slot machine players on how the house always has the edge, and how the results of each spin can be random and programmed at the same time. Here, you will also find some tips on beating the slots. The results of any slot machine can only be as random as a human programs it to be. Just like with all other casino games, the odds of winning in all slot machines are always set so that the house always has an edge. The main goal of this chapter is to explain to slot machine players their odds at winning, and the ways in which slot machines are programmed to give the house an edge affects your chances of winning. You can find a list of most online slots RTP, and use it to find the games with the highest payout rates. The fact is that all casino games have been designed to make money for the casino by paying out less than the true odds. When it comes to table games, this can be relatively simple. For instance, in double zero roulette, the numbers ‘1’ all through the value ‘36’ including ‘0’ and ‘00’ puts the player’s odds of winning at 37 to 1. So, it’s no surprise that the house normally pays all single-digit winners 35-1. What are the Possible Outcomes of a Single Game? The odds of winning at the slots are similar to the roulette table with the only real difference being that there are far more possible outcomes when it comes to slot machines. In fact, there may be thousands and sometimes even millions of combinations in either of the 3-reel or 5-reel slots. Game designers also get to assign exactly how much the winning combinations pay out to the players. There were about 1,000 possible combinations to the early 3-reel slots which featured 10 symbols. With reels holding more symbols (20) and spaces (20) the possible combinations increased from 10x10x10 or 1000 winning combinations to 40x40x40 or 64,000 winning combinations. If there are blank spaces in between the lines the number of possible combinations increased to 8,000 of 20x20x20. The alteration from physical reels being used in the slot machines to virtual reels gave programmers the ability to improve the game. It also gave game programmers more control on where the numbers on the virtual reels stopped. Nowadays, every slot with 100 stops on each of the three reels has over a million possible combinations. The world record for highest sum paid to the winner of a slot machine stands at $39 million, which was given by the 3-reel Megabucks slot machine. This particular slot machine had a whopping 50 million possible combinations. Since most of the newer video slots have five reels, the combinations can be as many as the game’s programmers want it to be. To be more specific, each of the five reels have 100 symbols, which takes the number of possible combinations up to 10 billion, which is unbelievable. When it comes to mechanical slots, the most common type has got to be the three reel slot machine, which has a total of 20 symbols on each of the reels. To calculate the exact amount of combinations on the reels, we have to multiply the total number of symbols or stops, on each of the reels by the number of stops on each of the remaining reels. So, there are 8,000 combinations on a 3-reel slot machine. That’s 20x20x20, so if the jackpot is at 777, and only one 7 appears on each of the reels, the probability of hitting the jackpot is 1/20×1/20×1/20, and if 7 appears twice on a single reel, the probability of hitting the jackpot looks like 2/20×1/20×1/20. Newer online slots use more than four reel symbols. The random number generators that are used in online slots are able to calculate large sets of numbers, leading to far greater possibilities. Modern slots feature more paylines than the traditional slot machines. The Super Jackpot Party, which is a classic WMS slot machine features up to eight reel symbols that make up the winning combination, apart from the bonus event which is launched whenever the party guy or noisemaker symbols appear on the reels. What makes the math complicated is that the symbols have to be random numbers that have been assigned, with payoff values assigned at three, four and five of a kind. The sheer amount of paylines also makes the combinations more complicated. For example, in a 30-line slot there are 30 chances for the player to line up the symbols for a winning combination, rather than just a single one. The same goes for every possible combination which means that the game programmers need to account for each of the possible combinations up to 30 times. When it comes to bonus events, almost all of the recent slots feature events where the regular play stops and players get to spin a bonus wheel to get free spins and other prizes, instead of having to make more wagers. This is why the payoffs that are made during the bonus games also have to be included into the overall wins of a slot game. The player cannot see the odds of a game. The player cannot see which slot machine will give higher payoffs. The player can see the pay tables of each slot machine. The player can see the bonuses that are offered by each slot machine. Almost all casinos don’t post the percentages of the payback, which means that there is no way for a player to know exactly what their odds are while playing a slot machine. Since these details are regarded as proprietary and only known by the casino and the game developers, even different machines that feature the same slot game may have different paybacks for the same game. Another reason for this discrepancy is because most game developers design several versions of a single slot game which are then distributed to casinos, so each version of the same game has a different payback percentage. What this means is that while two machines or slot games may look identical to the naked eye, their payback percentages are most possibly very different from each other. However, it should also be noted that most of the slot machines that payout large sums in their jackpot usually pay far lesser on the small wins as compared to slot machine games that offer smaller jackpots. This makes the larger slot machines more volatile in comparison to their smaller counterparts. But, then again, this is not always true since large jackpots are so rare that the game may still have a normal percentage when it comes to the smaller payoffs. In comparison, the slot machines that feature free spin bonuses are considered to be more volatile as compared to the pick em’ bonuses. When it comes to slot machines, volatility matters and makes the difference between whether a player wants to accept the bankroll eating losses or maximize their chances of winning big. If the answer is yes then you would want to play a slot that has high volatility. On the other hand, for players who would rather have the small wins that come frequently and extends their playing time, without the chances of winning big, then the game with a low volatility is the one for you. Regardless of whether or not a slot machine has got a high or low volatility percentage, you can rest assured that the house will probably have an edge on the amount of payouts which are going to be less than the true amount of winning odds. The casinos usually have an edge when it comes to slot machines mainly because the winners are paid less than the true odds of winning. The odds of winning in slots are complicated further by the complex algorithms that are used to determine the combinations along with the various paybacks per winner. The player can never look at a slot machine and guess their odds of winning since even two slot machines that look identical can be programmed to provide different odds. Whenever a casino owner chooses to purchase a slot machine from a manufacturer, they get to choose the payback percentages of the slots. Normally, slot machine manufacturers design the same slot game with an 87%, 89%, 91% and 93% payback percentage. The casino gets to choose which version of a particular slot game works best for their business. This means that slots and table games are both programmed in the same way, as in, the odds of a game are set to lead to a predetermined payback percentage. On the roulette wheel, the ‘00’ has 38 numbers 0, 00, 1 to 36. This makes the odds of coming up against a specific number is 37 to 1. The difference between the 35-1 payoffs and the 37-1 odds are determined by the house, and the house pays only 35-1 on any winning number. Divide the difference of the two numbers with 38 possibilities and the answer is 0.0526, putting the house edge at 5.26%. Keeping these points in mind the roulette table is programmed in a way that the house keeps 5.26% on thousands of wagers. That being said, it is possible for the same number to appear four to five times in a row, but still, the odds of the game eventually leads to a house edge over time. 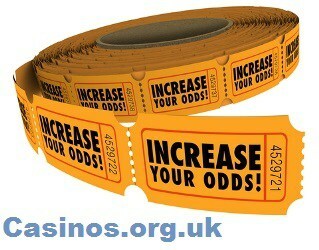 Instead of reels what if the results of slots were driven by number generators? Let’s take a look at the odds by replacing the famous slot reels with the wheels of a roulette table. Let’s line up three roulette-type wheels each of which is marked into one hundred segments. Mark each of the segments with a symbol so that each wheel gets one 7, 5 bars, 10 cherries etc. The dealer then spins the wheel and drops the ball on each wheel. What we get is a total three wheel combination of one million. This is the number one would get if a number generator had to predict random numbers with each reel having one hundred numbers. This makes it easier to calculate the amount of possible combinations where the ball could land on the same symbol on each of the wheels. Since the ‘7’ is only present once on each of the wheels, its chances are 1x1x1. For the 5 bars, the possible combinations are 5x5x5, or 125 to a million total combinations. For the 10 cherries, the possible combinations are 10x10x10 or around 1,000 three cherry combos. These results may be considered as the programmed combinations of the odds. This is how the odds work in the modern computer slots, by not forcing the game to pay a particular percentage, but rather, let the normal odds in a game drive the long term results of an expected percentage, which is quite similar to the table games. While the idea of slot machines being both programmed and random may be difficult for a person to imagine. But, the notion is not that complex. The following are some questions that are often asked of the random and programmed slots. QUESTION – Since all slots are random, shouldn’t the winning symbols show up as much as losing symbols since slots are random? ANSWER – It is important to realize that a “random result” cannot be compared to an “equal result.” It is not necessary for a slot to be programmed so that the symbol of the jackpot shows up as much as the black spaces, or the bonus symbol shows up as much as the cherry symbol. Rather, the odds of a slot machine are set so that more blank spaces show up as compared to the winning symbols. Likewise, small winning symbols are programmed to show up more as compared to the large jackpot symbol. When it comes to three-reel slots, this leads to more losing spins, while on more recent five-reel video slots this leads to more wins for the amount that is lesser than the bet. What this means is that the game programmer sets the odds of the slot machine and allows the numbers to generate randomly. QUESTION – How does a slot player account their streaks if the slots are random? How is it possible that sometimes a player can lose in a row and change machines, while other times the player keeps on winning? ANSWER – To answer this question we need an example; let’s take a 3-reel slot that has a 12% hit frequency, which gives the winner a one in 8.333 chance of winning. The first spin has a 88% chance that no winning symbol will come up, while the player has a 77% chance of losing twice in a row, and a 68% chance that the player will lose thrice in a row. With 20 in a row, the player sill has a 7.8% chance of ever spin being a loss, which is normal probability. In this way, a player on a slot machine that has a 12% hit frequency will have streaks of 20 or maybe even more losses if they play for long enough. QUESTION – If slots are really random then how can picks in pick’ em bonuses make a difference while having a payback that is already programmed? ANSWER – Yes, the choices of a player will make a huge difference when it comes to the pick’ em bonuses. That’s because the programmer knows that the bonus event will yield an average payback over time. To get a better picture of this lets take an example; in a bonus event, a player picks any one of three symbols that reveals the reward. If the player touches one symbol and is rewarded with 25 credits, while touching another symbol gets them a reward of 50 credits, and touching another symbol yet again gets them 75 credits, regardless of what symbols they touch the player has no way of knowing which symbols are hiding which rewards. This makes the results of reels a random event. But, over time, the player of the slot can expect to receive a reward only a third of the time, which brings their credits to 50. The game programmer can then build the average into their calculations to get the exact payback percentage. This means that a random result contributes to the odds that drive the paybacks over the long term. This is similar to the spinning reels of the slots and it is also the same way that the table games at casinos work. The random results cannot be compared to the equal results since the odds are always set for large winning combinations to show up lesser as compared to other combinations. Slots mostly have payback percentages that are targeted and set by the initial programming, while the results of each reel spin are random. The programmed percentages of the slots work similar to the percentages of the table games where the odds often lead to expected returns. While it is true that there is no strategy that can over smart the house edge, especially in the casinos in Las Vegas, there are certain exceptions that occur rarely. But, that too is a test of one’s skill. Although, slots are not designed to be beatable, there may be a change coming as slots both in online and brick and mortar casinos look to attract more millennials. The State of Nevada had legalized electronic games that are specifically skilled based back in 2015, and in many countries, skill based electronic games are already part of the mix. For instance, in Japan, purely skilled based slots called “Pachisuro” which is a blend of slots and the traditional Japanese Pachinko game have been introduced where the players need to utilize their skills in order to succeed at winning. That being said, Vegas still remains to be the trend setter as far as new technology and casino games go. While even the newer games are being designed to give the house the advantage, there are some games that are beatable. Piggy Bankin – This 3-reeel slot game was designed by WMS Gaming and was considered to be the trend setter when it came to banked bonuses. The Piggy Bankin slot machine featured a dotmation screen at the top box right above the reels. A coin would be added to the animated piggy bank on the screen whenever three blank spaces showed up on the reels, and when the ‘break the bank’ symbol appeared on the payline, an animated hammer broke the piggy bank, revealing the spoils. Players soon found that if they played with only enough coins in the bank they would have an edge over the house. Racing 7s – Before the developers IGT ever set foot on the video format, the developed the Vision Series with the help of a LCD panel at the top box. The slot machine featured a red, white and blue ‘7’ on the track, and every time a 7 of the same color landed on the payline, the color 7 would move a bit closer to the finish line. 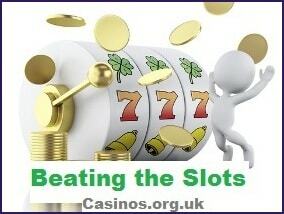 Beating Racing 7s proved to be incredibly easy since all a player had to do was look for the screen where the 7s were closer to the finish line to get the bonus payout. Fort Knox and Buccaneer Gold – While playing Fort Knox if the player was able to get five numbers in the 10 digit code they had the advantage. And once the whole code was solved the player got the bonus. This was one of the many slot games that were termed as banked bonuses. Buccaneer Gold – In this famous slot machine game the main objective of the player was to collect all five of the daggers that were stuck at the ship’s rail. So, if the screen showed that there were a few daggers left, the player had the edge by getting the remaining daggers in order to get the bonus. S&H Green Stamps – This particular slot game was one of Bally Technologies’ best slot game but it had a major flaw that played into the advantage of the player. While playing, you would have to collect green stamps as they appeared on the reels. If the player was able to fill a stamp book with 1,200 stamps they were able to win the bonus event. This meant that players who were in the know only had to look for those slot machines where half of the stamps were already in the book and collect the rest to get the bonus. This gave the players an edge over the house. There is a reason why you wouldn’t find these slot games on casino floors today. Especially in the larger casinos, while you could get lucky and find one of these old machines in the small casinos that are still operating dated machines, buts it’s a long shot. In any case, starting close to the finish will improve your chances of winning in any banked game. Another way of beating the slots is by looking for those progressive slots that pay off larger than usual amounts in their jackpots. But, this is a technique that works better on video poker than on the video slots. The payback percentages in slots are so low that even in games where the jackpot looks oversized, the house is actually keeping most of the wins. That being said, playing slots when the jackpot amount is of a certain size will always be better than playing a slot where there are lesser amounts involved in the jackpot. First you start by making rounds to al the slots and chart the jackpot amounts. Over time you will get an idea on the average amount of payoffs whenever a player wins the jackpot. You must play only when the jackpot reaches that average. For instance, if the slots that have been charted hit the jackpot on an average of around $2,500, then only play the game when its at $2,500 or higher. Those players who are looking to use this method should be aware that there are no guarantees that you will win the jackpot even if you start playing after the average amount has been reached. In other words, knowing the exact average of any jackpot does not reveal the breakeven point in any slot machine so there are no guarantees that a player will actually hit the jackpot. The way in which slot machines are programmed makes it extremely hard for anybody to guess the possible average where they could hit the jackpot. For example, let’s imagine that a single slot machine’s jackpot hits around $2,500. This means the slot would have to hit $5,000 before its returns are 100% again. With these odds the player is only able to hit the jackpot once the game’s return’s are met which means the house always has the edge. But, waiting will ensure that that your average payout will be higher as compared to if you starting playing from the beginning, that is, if you manage to hit the jackpot. Those who prefer to go hunting for jackpots must be aware that there are just as many pitfalls as there are rewards when you hit the jackpot. While we will be discussing all about ‘Bonus Events’ in the latter chapters, here we are going to deal with the basics of skill based bonuses when it comes to slot machines. At the moment, slot machines that are completely skill based have not yet been fully introduced in many of the casinos in Las Vegas, but there are skill based bonuses that players can take advantage of. The famous slot manufacturer, IGT introduced the Centipede, which allowed users to play older versions of famous arcade games in the bonus round. Another slot manufacturer, GTech also introduced their version of the skill based bonus round in their Zuma slots which was based on the very popular online game. While a player’s skill does make a difference during these skill based bonus rounds, they have not been programmed to be beatable slots, even for those who consider themselves the grand masters of the classic arcade games. According to average, and the variations in jurisdiction, only a maximum of 4% of a slot’s payout may be based on the player’s skill, with the house edge always being higher so actually getting the full 4% does not really make it profitable for the player. Most slots are designed to be non-beatable in the long run by slot manufacturers. While a slot player’s skill does make a difference, it does not guarantee that the player will have an edge on the slot game. Progressive jackpots offer more opportunity to win jackpots since they payoffs are usually higher for high stakes. Those users who are playing banked bonus slots only have an opportunity to get an edge over the house if they have started playing halfway towards the jackpot triggering average.